When Theresa May called the snap election for June the 8th, she obviously didn’t realise that I had a trip to the Lakes booked on that day. Bookings for Youth Hostels need to be made well in advance in order to guarantee the best rooms and I’d made this June booking way back in December. This would be my first trip away from home during a general election. Naturally, I didn’t manage to get myself organised in time for a postal vote and so this would also be the first time I hadn’t voted in any election, general or otherwise. Major fail. On the other hand, I live in a very safe Tory seat, so my vote has never counted for anything. Despite this, I was annoyed with myself. On the plus side, my daughter, Tilly, would be accompanying me on this visit and despite the fact that she isn’t quite old enough to vote, there was a deal of excitement around the election within her friend group, involving a great deal of debate on Facebook Messenger. At the centre of this debate was Jeremy Corbyn, who seemed to have assumed the role of either pop idol or bogeyman, depending on point of view. I was a mere observer but it was great to see my kid’s generation engage in political debate. 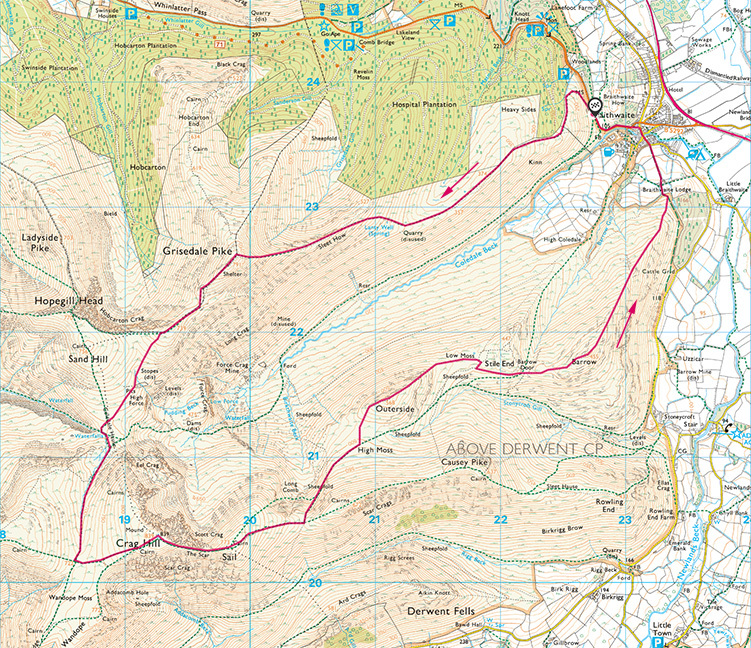 The Coledale Horseshoe (14.0km and 1071m of ascent). Start/end: Braithwaite. We’d driven up to Southport on the Tuesday and had stopped over with my mum. Early on the Wednesday, we drove up to the Lakes in fine weather and aimed for Braithwaite, northwest of Derwentwater with the intention of starting on the North Western Fells. I’d planned a walk referred to as the “Coledale Horseshoe”. 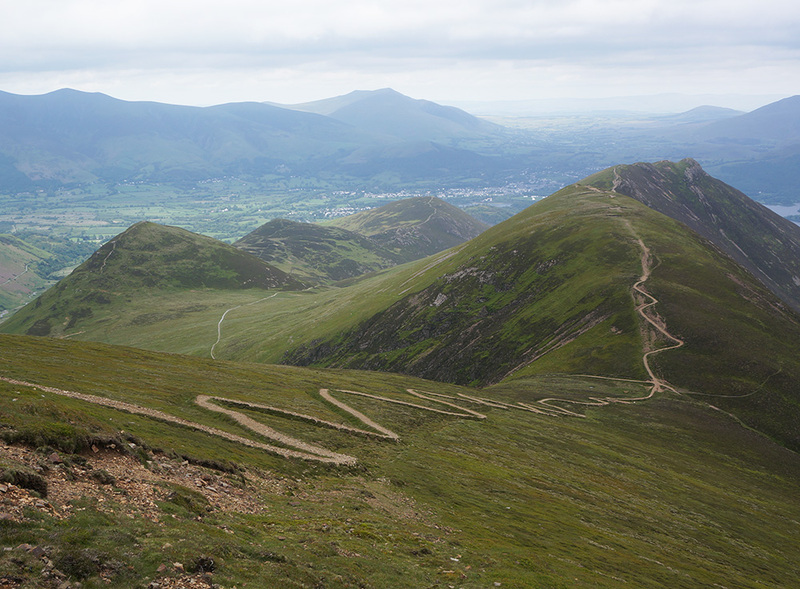 There are a number of variations on this walk but ours is fairly orthodox and takes in five Wainwrights (Grisedale Pike, Eel Crag, Sail, Outerside and Barrow). The Skiddaw Massif from the rising path to Sleet How. We parked up in Braithwaite and set off in good spirits although Tilly was feeling a little under the weather and struggled up the pull onto Sleet How but recovered during the walk along the ridge. On the approach to the summit, the ridge narrows with steep drops either side down to Coledale Beck on the left and to Grisedale Gill on the right. 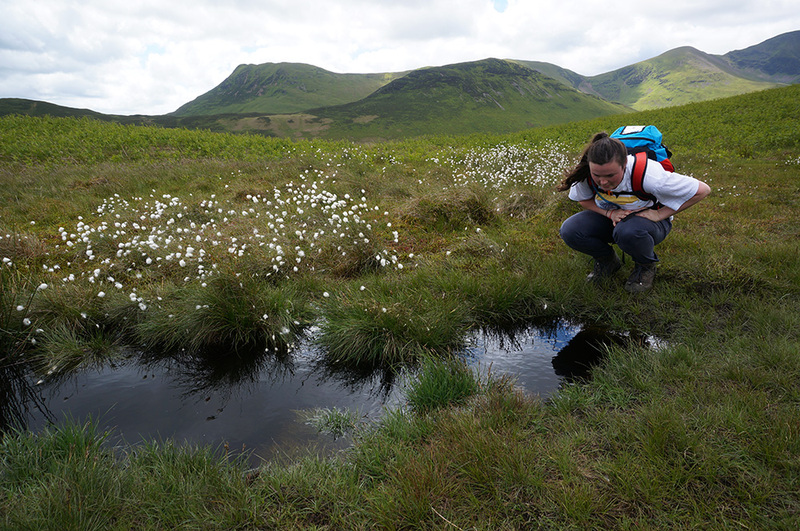 Tilly looking at frogspawn in a small pool, surrounded by Cotton Grass and Causey Pike on the skyline. The final push is a steep one and with loose gravel underfoot, it’s a little tricky too, especially as the wind began to blow. By the time we reached the summit, the wind was gale force and it was difficult to remain upright as we faced into the full force of the wind coming in from the west. Tilly on the final approach to Grisedale Pike summit. After a brief stop (it was too windy for a relaxing break) we headed off along the ridge path towards Sand Hill. 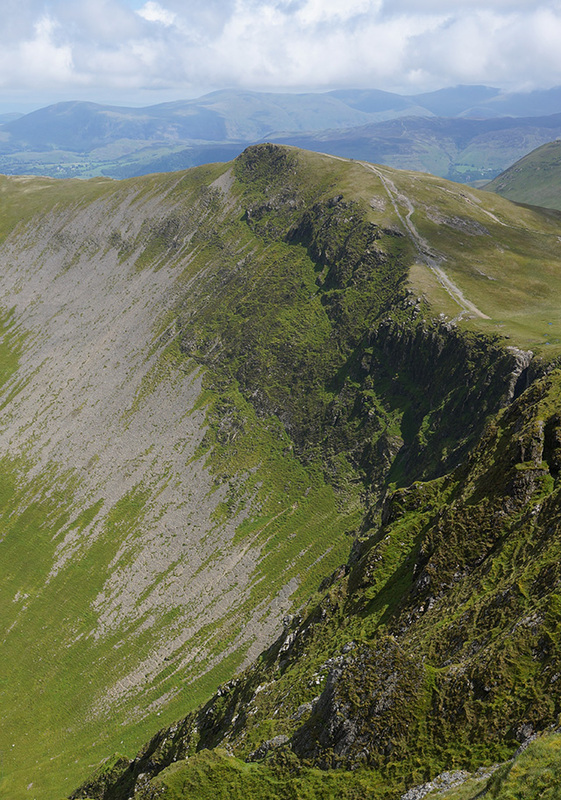 Some versions of this walk take in Hopegill Head but I’d planned a visit to that top during another walk, so we swung south down into Coledale Hause and were relieved to be out of the wind. 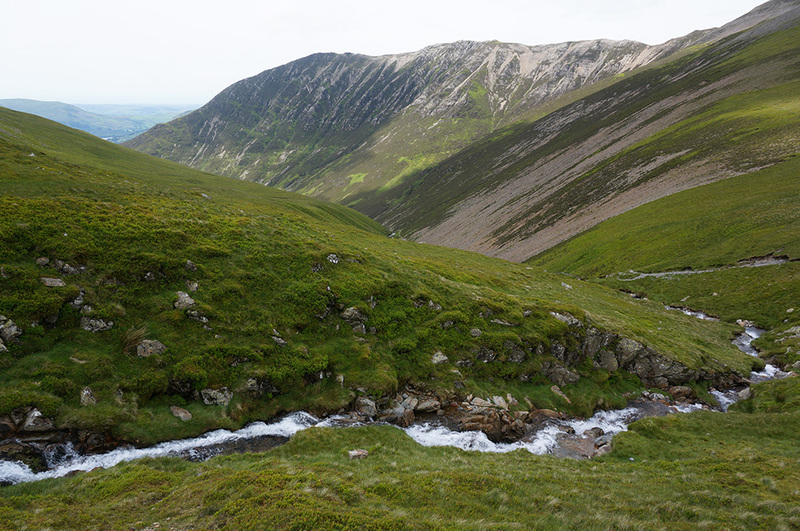 Liza Beck at Coledale Hause, looking towards the Whiteside – Hopegill Head ridge. After a short break, we continued south along the well-defined, rising path until we reached the left-hand route up to Eel Crag at which point, Tilly insisted on another break and threw herself to the ground. She was obviously not on her best form and had lagged behind for most of the day. This is the third year in a row that Tilly has accompanied me on a Lake District trip and in previous years, she has easily matched my pace, with room to spare. So we wondered whether it was my improved fitness or her declining fitness that was to blame and concluded that it was probably a bit of both. Just as well she came along then, because she had her Duke of Edinburgh Gold expedition coming up in a few weeks time. We now headed uphill towards Eel Crag, which at 840m would be the highest point on the days walk. 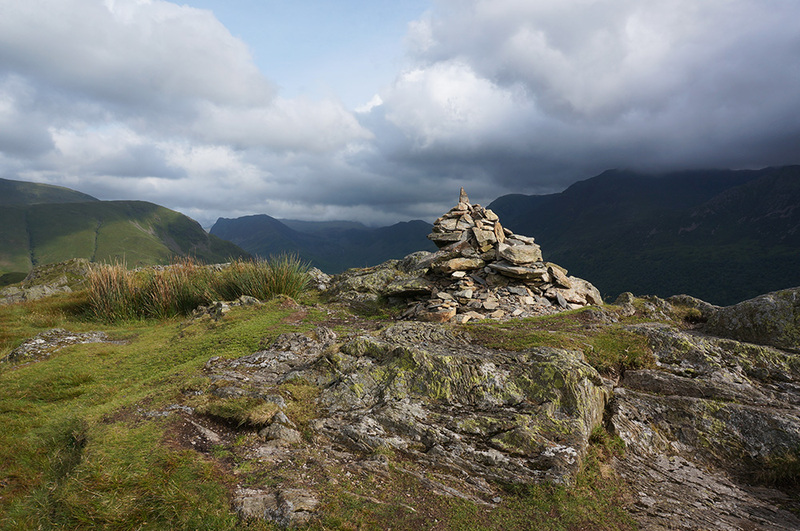 The summit at Eel Crag is a wide, stony dome with a small stone-built Ordnance Survey trig pillar in the middle. There’s no shelter and as it was still quite windy, we moved on towards our next Wainwright. The Coledale Valley and Force Crag Mine from Eel Crag with Skiddaw in the distance. Sail is only about 600m from Eel Crag and we negotiated the steep drop from Eel Crag and the slight rise to Sail in under 20 minutes. The summit at Sail is rather disappointing. There is a tiny cairn but otherwise it just feels like you’re standing in some grassy moorland – it’s possibly the least summit-like summit I’ve visited. Wainwright suggests it has “nothing of immediate interest” and, as usual, he’s right. Fortunately, we had an interesting treat ahead. In an attempt to mitigate erosion the path down to Sail pass has been given an amazing serpentine form. This reduces the steepness for those using it but also creates a very distinctive visual form. There are other examples of this method of path-making (repair) in the Lakes, but this is the most impressive I’ve seen. Using the new path, we dropped down to Sail Pass and took a well-earned break, a drink and a snack. The zig-zag path restoration down to Sail Pass from Sail. Refreshed, we headed north, down from the pass a headed for Outerside. This section of path was one of my favourites. 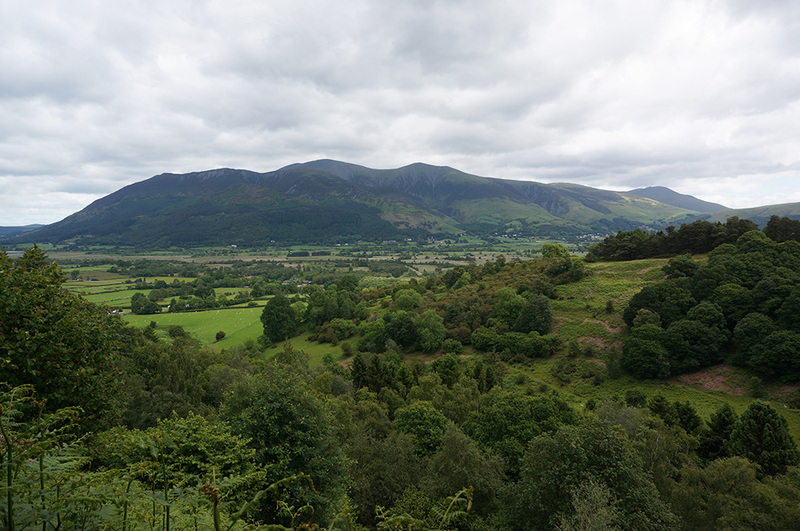 It strikes a diagonal across a very steep slope and there are plenty of dramatic views across the Coledale valley to Force Crag Mine and Grisedale Pike. As the slope eased, we left the main path and headed across to Outerside. This summit is easily gained from this direction and there is sometimes a sense that it might be cheating to bag the lower summits on ones way down from higher peaks. None the less, they all count and Outerside was dully bagged. The path north from Sail Pass with Outerside in sight and Skiddaw beyond. 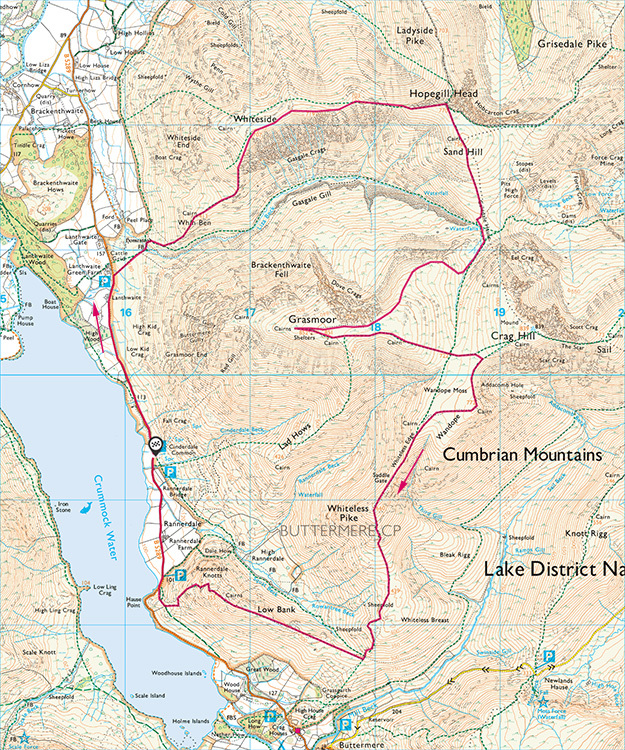 The route from Outerside to Barrow is not as straightforward as it appears on the map. As is often the case with the lower fells, there are a multitude of paths and it’s not always obvious which one leads to your destination. Eventually and with just a few wrong turns, we found our way to Barrow Door and then along the ridge to Barrow summit. A rocky top with a pathetically small cairn but great views over Derwentwater. 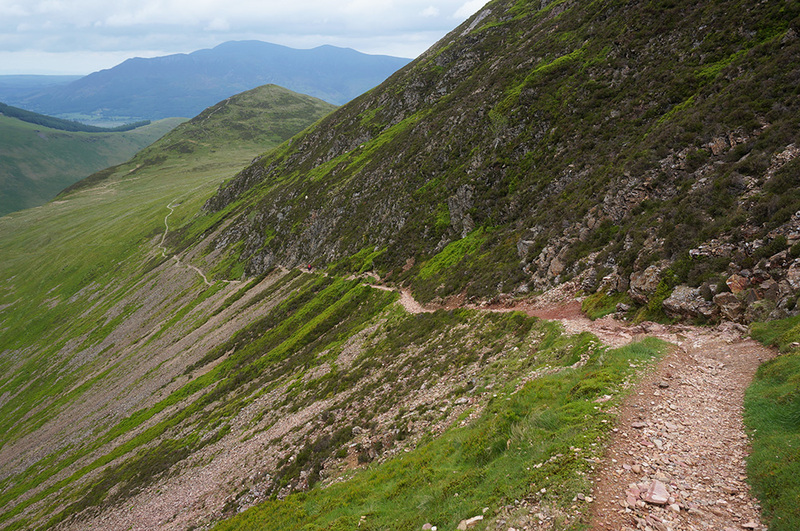 Returning to Braithwaite was a simple case of following the ridge path all the way back to the village and the car. Before 5pm we were on our way to check in at Ambleside YHA. We woke on election day to persistent, heavy rain and decided that a day walk was out of the question. We went into Ambleside, bought a Guardian and sat in Esquires coffee shop, reading the election predictions and drinking hot, frothy coffee (and hoping that the rain might ease). Tilly continued her online debate about politics and asked me lots of questions about economics, tax and the principles of socialism and how this differed from the way the country is currently run. All this new knowledge was filtered and fed back into her online debate. The rain didn’t abate and after a couple of hours of reading the paper and discussing the probable outcome of the election, we decided we’d have to make alternate plans for the day. I didn’t have any particular preference, so I ran a few popular attractions past Tilly and when I got to “Aquarium”, she said “Yes, that’s it! I want to go to the aquarium”. I have to admit, it wasn’t in my top five things to do list but, why not? So we had some lunch in Daisy’s Cafe (simple but excellent and good value) and then headed to the Lakes Aquarium. It turns out that the Lakes Aquarium is really rather good and we spent a pleasant couple of hours looking at fish of all sorts and a colony of leaf-cutter ants. It’s a pretty good antidote to a rainy day. That evening, we lay in our room listening to the election results on the radio until I realised (again) that nothing significant happens until the early hours of the following day. The following day started fine with dry weather forecast for the whole day. A good opportunity for another day walk, so we left in good time after a hearty YHA breakfast and discussed the election results on the way to our start point at the Cinderdale Common car park on Crummock Water. 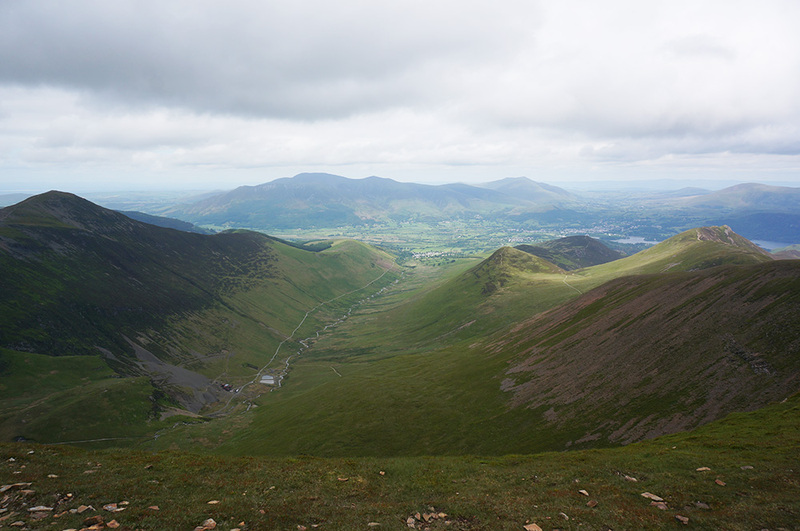 A Whiteside – Grasmoor Round (15.7km and 1185m of ascent). Start/end: Cinderdale Common car park. This walk would form a figure-of-eight with our previous walk, another round (or horseshoe) that passes through Coledale Hause. This time, starting at Whiteside and taking in Hopegill Head, Grasmoor, Wandope, Whiteless Pike and Rannerdale Knotts (6 Wainwrights in total). Having parked up, we set off north, along the road to Lanthwaite Green where we took a right onto the footpath to Whin Ben. Over a low spur, we dropped down to Liza Beck and crossed the footbridge, after which, the climb really started. It’s a steep climb to Whin Ben but once there, the gradient lessens and the walking gets easier (for a while). Looking back, there are great views over Crummock Water and to the Western Fells. The day was brightening and there were even some short sunny spells although there was still mist over Grasmoor and Hopegill Head as we climbed towards Whiteside. 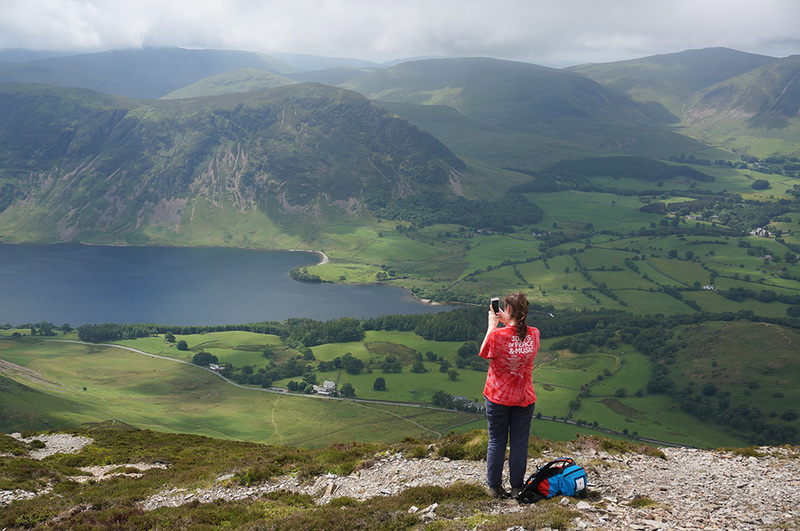 Tilly photographing Crummock Water above Whin Ben, en route to Whiteside. The final pull up to Whiteside summit is a tricky one, requiring hands, feet and a head for heights. It’s a really exciting climb with dramatic views down into the Liza Beck valley and (once the mist had cleared) amazing, almost Alpine views towards Hopegill Head. It’s a climb I’ll definitely want to do again. 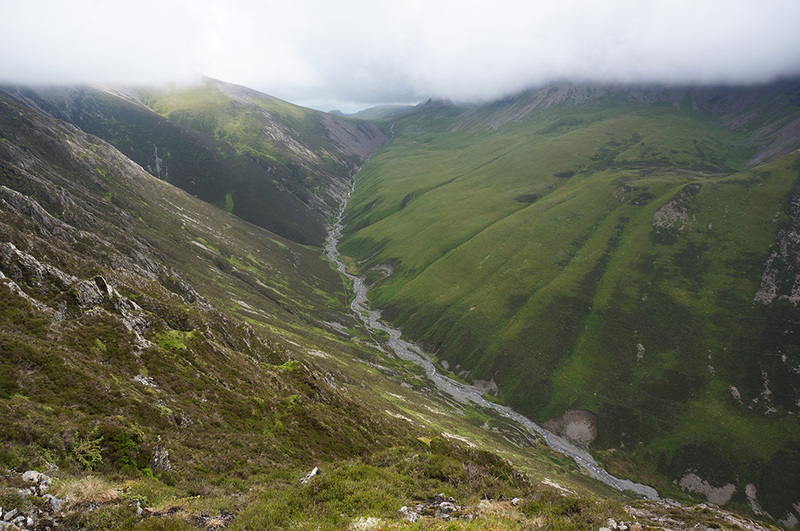 The Liza Beck Valley from Whiteside and low cloud over Hopegill Head and Grasmoor. There’s a proper rocky summit to Whiteside with a small but respectable cairn and a definable sense of achievement on arrival. We sat at the summit and had a drink and a snack and looked along the beautiful and well-defined ridgeline to Hopegill Head. Hopegill Head from the path below the summit at Whiteside. The arete between Whiteside and Hopegill Head is narrow enough for it to feel exciting but not so narrow as to feel precarious; actually, it’s a near-perfect walk. So much so that I was almost disappointed to arrive at Hopegill Head but the view across Hobcarton Crag to Grisedale Pike was stunning. There’s no summit cairn here but there is a lovely shattered rock outcrop that gives a real sense of place. We spent a while at the summit, taking in the views. The view east from Hopegill Head across Hobcarton Crag. From Hopegill Head, the only way is down and so we plodded down Sand Hill back to Coledale Hause, where we’d been two days before. 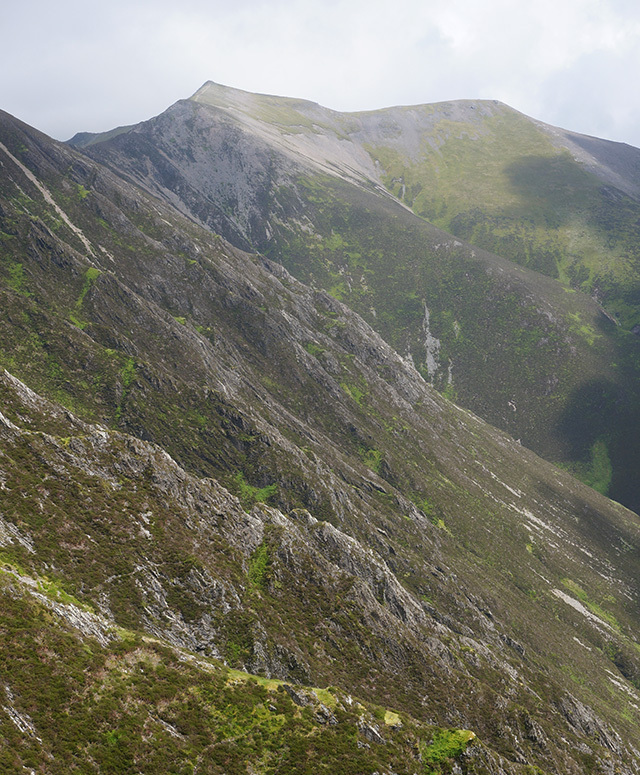 Our next top was Grasmoor and headed south out of the hause looking for a path striking off right. After a while I realised we must have missed the path and suggested that we retrace our steps but Tilly would not hear of it. So we started the climb over steep, hummocky moor, hoping to meet the path further up. 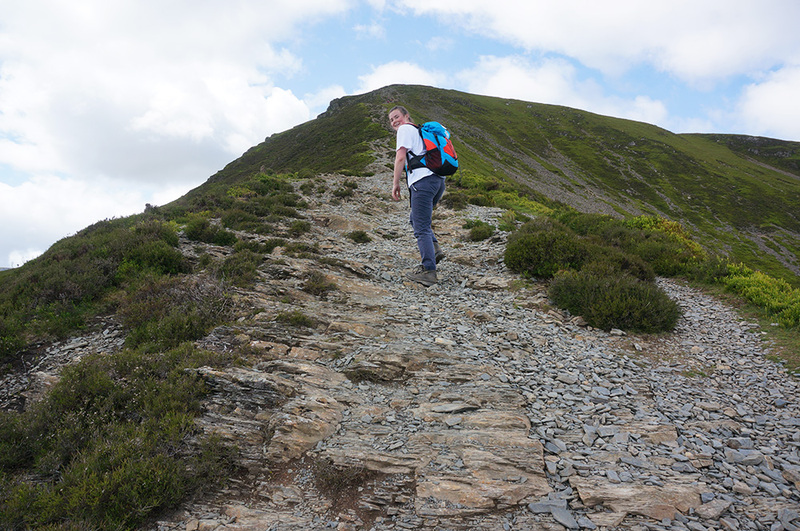 Eventually we did meet the path as it swung round above Dove Crags and we followed it to the summit at Grasmoor. There’s a large shelter cairn at the summit and excellent views out over the Western Fells. However, the cloud base was still low and visibility was only partial. This was the highest point on the walk at 852m and, in fact, the highest point in the North-Western Fells. After a short break, we set off east, on our way to Wandope. Wandope is a very odd fell when approached from the west. It doesn’t feel like a fell at all. There is very little height gain from the main path to the summit (which is marked only by a diminutive cairn) and I began to wonder whether it was some sort of anomaly. It wasn’t until I later viewed Wandope from Knott Rigg to the east, that I understood the true nature of the fell. From the underwhelming summit at Wandope, we tracked back to the main path and at Thirdgill Head Man and then along Whiteless Edge, yet another lovely arete. By this time, the sky was clearing and the sun was shining and we had some lovely views across to the Grasmoor slopes and to Crummock Water. When we arrived at Whiteless Pike, conditions were idyllic. We took a longer than usual break and soaked in the scene. These are the moments that make all the hard work worthwhile. I was reminded of a similar feeling at Great Crag a year earlier when Tilly was also with me. 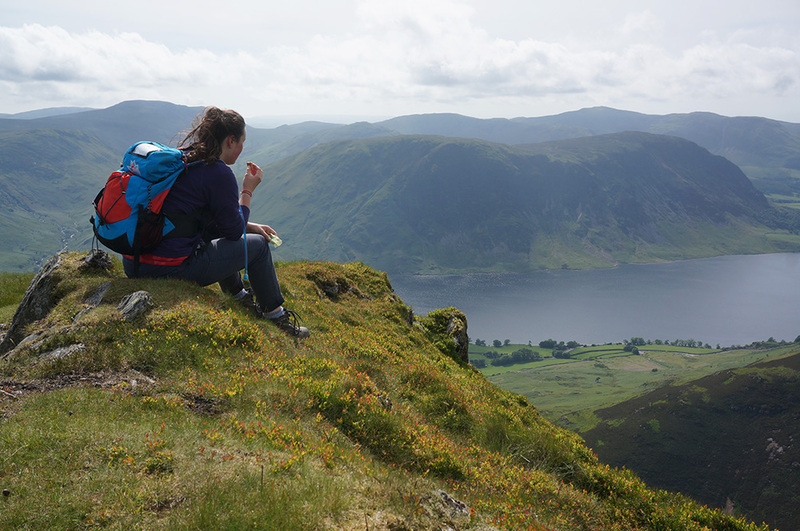 Tilly having a snack at Whiteless Pike summit and contemplating the view over Crummock Water. We were reluctant to leave the summit of Whiteless Pike but we could clearly see our next destination and it looked like a simple and enjoyable downhill route. Well it wasn’t entirely simple, there were a couple of rock steps to negotiate but nothing too difficult. The summit cairn at Rannerdale Knotts with the darkening Western Fells beyond. When we reached the end of the downhill slope and faced the rise onto Low Bank, Tilly was looking very reluctant. She’d done really well but was starting to flag. There was an escape route down Squat Beck and I suggested that she could take that and I’d meet her back at the car park but she decided to stick with it and we climbed the short rise onto the ridge and then along to Rannerdale Knotts, our final Wainwright of the day and a very satisfactory summit cairn. 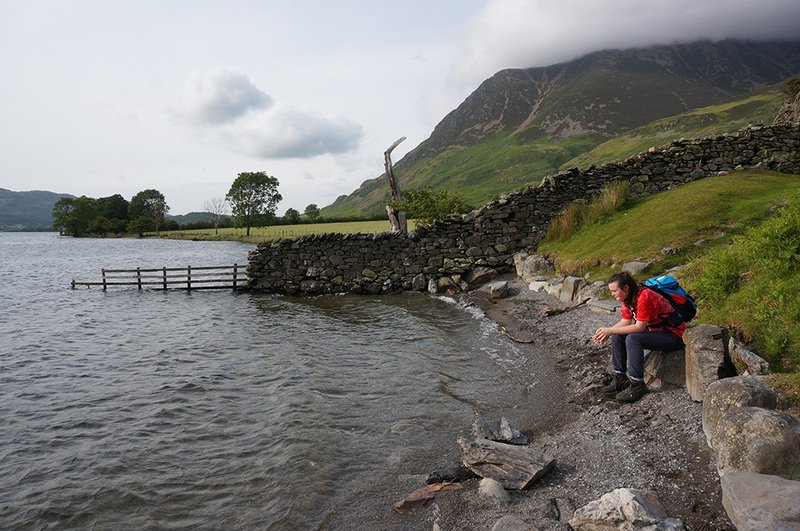 Sitting at the shore of Crummock Water after a glorious seven and a half hour walk. From there, it’s a quick drop down to the road on mainly pitched paths. We crossed the road and walked down to the lake shore and sat, watching the water lapping over pebbles and grey sand. A beautiful end to really great walk, possibly my favourite of all the walks I’ve done so far. The weather forecast for the Saturday was poor, so Tilly had decided to go home a day early as she still had some revision to do. I was staying up in the north-west and would be going over to Manchester on Monday for external examining duties at MMU. So on Saturday morning, in pouring rain, I drove Tilly to Oxenholme station just outside Kendal and put her on the train south. I had lunch in Kendal and then drove back to Borrowdale YHA hoping that the forecast was right in predicting a fine evening. By 4.30pm the rain had stopped and although it was still overcast, I set of from the hostel to bag Castle Crag, the lowest of all the Wainwrights and the only one below 1,000 feet. It was windy but as the evening went on, more and more breaks appeared in the cloud and patches of sunlight raced across the hills around Borrowdale. The view north from Castle Crag summit along the Derwent Valley, over Derwentwater and to the Skiddaw massif. Castle Crag has, in the past, been the site of an active slate quarry and the route to the summit includes a path, which on initial view seems impossibly precarious, over quarry spoil. In fact, the path is very stable and obviously well maintained. It’s an interesting fell with lots to explore and it would be a good objective even for young families. 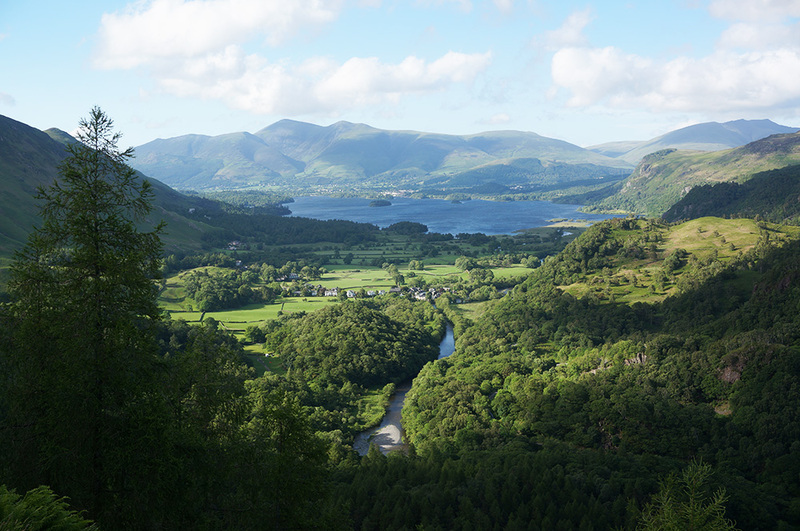 At the summit, there’s a war memorial and a glorious view across Derwentwater to Skiddaw. All in all, a very pleasant evening. Sunday was an overcast and blustery day so I decided to bag a couple of low-lying outliers before heading back to Southport. I checked out of YHA Borrowdale and headed to Wythop Mill, parking at the old school. The first objective was Ling Fell, a simple, grassy dome and a relatively easy climb. On the way up, I met a young couple, kitted out with all the gear who looked me up and down and warned me that conditions at the summit were really difficult as if to suggest that my clothing was inadequate. I thanked them for the advice and headed to the top. Admittedly, it was very windy at the top with a fierce gale blowing from the west but nothing compared to what I’d already experienced at Grisedale Pike earlier in the week. I quickly dropped down from Ling Fell and moved across to Sale Fell as conditions worsened. The wind blew harder and there was rain in the air. Despite the conditions, there were a few other walkers about and one woman I met suggested that we must both be idiots for being out and I had to agree. I got to the top of Sale fell and quickly beat a retreat, arriving back at the car in time to avoid the worst of the rain. 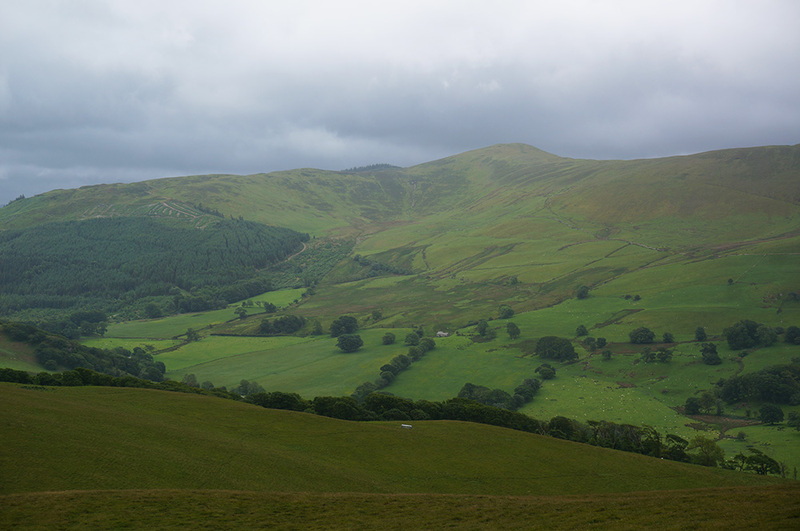 Lord’s Seat from Sale Fell in deteriorating weather conditions. A word about socks: Most likely the perfect sock does not exist because socks are a subjective matter – a bit like mattresses – soft, firm, short or long, not to mention colour and pattern. I only mention this because I’ve found my perfect sock. I really wanted to like Bridgedale socks because they’re a UK brand but (for me) they are just too soft and I have now come to the conclusion that the best hiking socks are made in the USA. For a while Smartwool socks were my favourite but I’ve now settled on Darn Tough (made in Vermont USA). Specifically, the Boot Sock Cushion (size Large in case anyone needs to find a Christmas present for me). They are a truly excellent sock with a dense, firm footbed and a firm grip around the foot without feeling tight. They wick sweat very well and just feel great. The only slight problem is that they’re a little-known brand here in the UK and the only place I’ve found that stock them is the Trekkit online store. Fortunately their service is good. So, I can now stop searching for the perfect sock.